New York, N.Y.— September 13, 2017 — Persistent Systems, LLC (“Persistent”), a leader in Mobile Ad hoc Networking (MANET) Technology and developer of Wave Relay®, announced today that it was awarded an $8.9 million contract award to provide more than 950 MPU5 radios to the U.S. Army National Guard’s Weapons of Mass Destruction Civil Support Teams (WMD-CSTs). The contract is in support of the U.S. Army’s Unified Command Suite (UCS) Program of Record, which is managed by the Joint Program Executive Office for Chemical Biological Defense (JPEO-CBD). The UCS program aims to provide communications interoperability between military emergency response elements and Federal, State, and Local authorities on the scene of an incident. The Unified Command Suite is a self-contained communications vehicle that can either be driven to or be air-lifted via a C130 to an incident location. The MPU5 radios enable a high-speed communication network to be established on-the-fly, which empowers CST personnel to operate across the incident area while remaining connected both to the vehicle and to each other. The MANET element of Persistent’s solution creates a vast, self-forming, self-healing radio network that does not require outside infrastructure to work. Should a node drop out of the network, sensor data collected by a Civil Support Team member will simply be routed another way. Using the MPU5 also means cutting down on the number of relay radios needed to push signals over and around obstacles. The MPU5 provides push-to-talk audio, video encoding, and an integrated Android™ computing environment that allows the installation of 3rd party applications. It is a 6W 3×3 MIMO radio which provides extremely long range and throughput exceeding 100 Mbps. 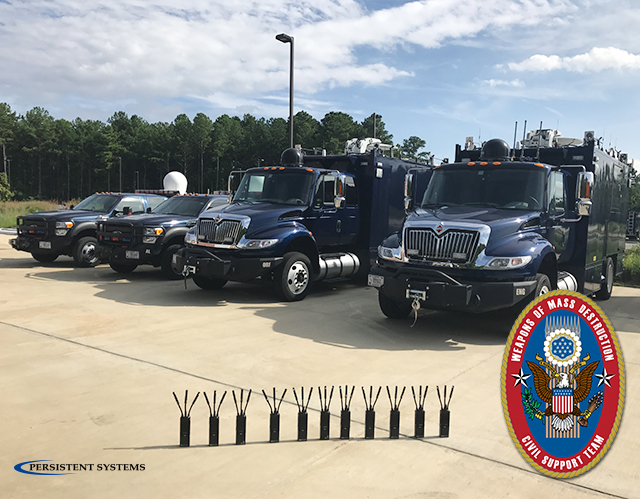 These capabilities enable National Guard Civil Support Teams to network their sensors and transmit data collected in the field to the UCS vehicle and then on to a national lab for analysis. Persistent has customers in the Army, Air Force, and Department of Homeland Security. Persistent has already begun delivery of its radios and expects to make another delivery of 500 radios to the Unified Command Suite program this month. The radio integration is being performed by NAVAIR in Patuxent River, Maryland. Headquartered in New York City since 2007, Persistent Systems, LLC (“Persistent”) is a global communications technology company which develops, manufactures, and integrates a patented and secure Mobile Ad Hoc Networking (MANET) system: Wave Relay®. The company’s R&D team has designed wireless networking protocols to support their cutting-edge Wave Relay® system and technology. Wave Relay® can transmit and receive data, video, voice and other application data under the most difficult and unpredictable conditions. Persistent’s suite of products is field proven and utilized in Commercial, Military, Government, Industrial, Agriculture, Robotics, and Unmanned System markets.